2. You are not prohibited from the possession or receipt of ammunition and or high capacity magazines by your local, state or federal laws. 3. You agree to the purchase and return policies of J and C Sales web site as set out on the site's "Company Information" page. 4. You authorize J and C Sales to correctly charge you for product and shipping charges via your credit card if that is your chosen method of payment. California: NO magazines over 10 rounds to anyone in the state. NO ammunition to the cities of Los Angeles,San Francisco and Oakland or the counties off Orange County Napa, Ventura and Yolo. If you have question please contact your local authorities. Colorado: NO magazines over 15 rounds to anyone in the state. If you have question please contact your local authorities. Illinois: We must have both your F.O.I.D. card and Drivers License on file. We will only ship to the address on the F.O.I.D. card. Please make sure your information copies clearly. No magazines exceeding 15 rounds to anyone in the state. NO sales of ammo, mags or parts to Chicago or Cook county. Massachusetts: No ammunition or magazine sales. Maryland: NO magazines over 10 rounds to anyone in the state. If you have question please contact your local authorities. New York: NO ammunition. No magazine sales over 10 rounds. Please refer to your local laws before placing an order. Washington D.C.:No sales of any of our products. 1. A signed statement from you that you can legally purchase the items you order from us. You are responsible for knowing and obeying your local, state and federal laws as they apply to you. Please don't expect us to know your local laws. If you have questions contact your local authorities. We will not knowingly ship items that are prohibited in your area. Example High Capacity Mags to California residents. 2. If your state requires a separate state issued document to purchase ammunition and firearm related products we must have a clear photo copy of it on file before you order. 3. A photo copy of your state issued photo ID clearly showing your date of birth. A driver's license works great! 4. Your signature that the information you are submitting is true and that you are complying with the law. Your signature also indicates that you authorize payment to J and C Sales via your credit card if that is your payment of choice. Sorry but shipping is billed to you on all orders. We bill the actual UPS charges for ground/residential shipments. We add a $2.00 processing fee to this. If you are buying ammunition the order will be sent "Signature Required" unless you specify otherwise! If we are shipping to an address other than the one for your ID we will ship with an adult signature required if we don't have an ID on file for that address. If you would like to know your shipping charges in advance please either call or email us and we will gladly let you know. Warrenties are from the Manufacturer or Importer only. We all make mistakes! If you need to return something to us please call first. If we have made a mistake in your order we will replace the item or refund your money and shipping costs. But if you just don't like the item you can still return it and we will refund your money for the item and shipping less 15% for restocking. Sorry but in this case you will pay shipping charges to return it. 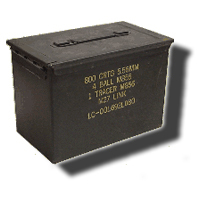 If it is ammunition YOU MUST CALL US we will send a UPS call tag for the box. You can not send ammunition through the US mail!!!! We consider you our friends and customers. We do not sell or give out your information. The file of names and addresses is kept off line. And your Credit Card numbers are not stored. We will from time to time send you a brochure about us. We just want to stay in touch with you about new items you might have missed. I hope you won't consider it junk mail. More like a card from an old friend!